More than 20 organizations will take part in the ‘Arctic: Territory of Dialogue’ 5th International Arctic Forum exhibition, including the Ministry of Science and Higher Education of the Russian Federation, the Ministry of Natural Resources and Environment of Russia, PJSC Gazprom, PAO NOVATEK, the Rosatom State Atomic Energy Corporation, PJSC MMC Norilsk Nickel, JSC Concern VKO Almaz-Antey, Rosmolodezh, and the Damen Shipyards Group. The Russian Ministry of Science and Higher Education stand will acquaint visitors with successful innovative developments from Russian universities and institutes of the Russian Academy of Sciences (RAS) aimed at solving various kinds of problems in the extraction and transportation of hydrocarbons, environmental protection, and the creation of new Arctic infrastructure solutions. The Ministry will be presenting a model airship for a round-the-world expedition across the Earth’s two poles, a dynamic arctic station model with a visualization of energy supply methods, and an automated Rescuer medical module, which is a medical evacuation life support device for people injured in accidents. NRC Kurchatov Institute has prepared models of the following projects: the Arkhangelsk production and logistics complex, a kilowatt generator employing renewable energy sources and electrochemical fuel cells, and an autonomous eco-settlement model. The JSC Central Research Institute for Automation and Hydraulics stand will introduce guests to exhibits focused on the development of Russia’s Arctic zone and will present a model of the control post of a ship moving along a narrow sea channel with the use of a ship Automated Radio Navigation System (ARNaS). The system guarantees high-precision vessel navigation regardless of the quality of satellite navigation system signals, as demonstrated by video recording of the simulated movement of the vessel and the corresponding indication of the onboard equipment. The Consulate General of Sweden, with the support of Swedish companies, will dedicate its exhibit to the fate of northern indigenous women. The exhibition has been completed by photo artists Sarah Cooper and Nina Gorfer in the style of photo collage. The artists travel to remote and inaccessible places in Swedish Lapland, Greenland, Iceland, and the Faroe Islands, explore the culture and way of life of the inhabitants there, collect stories, and create vivid, expressive portraits. A rich and diverse programme has been prepared by representatives from the regions of the Russian Federation. The Republic of Sakha (Yakutia) will present a model of the high-tech Zhatay Shipyard. One can also get acquainted at the stand with the main investment projects of Yakutia’s Arctic zone with the aid of a multimedia card. The Yamalo-Nenets Autonomous Okrug will present projects for the construction of the Novy Urengoy airport and the Northern Latitudinal Railway – a major project for the development of Russian Arctic railway infrastructure and a key element of the unified Arctic transport infrastructure being created. The Murmansk Region will talk about major projects aimed at developing offshore hydrocarbon production infrastructure, transport and energy infrastructure, and the resource base and production facilities of existing mining and ship repair facilities, and at creating new mining, chemical and metallurgical facilities, coastal fish processing and aquaculture enterprises, and at updating the fishing fleet. The International Arctic Forum exhibition programme also includes cultural and historical projects. Guests will be able to learn more about the history of the Krasin Icebreaker, a ship that has become a symbol of our country's leadership in the development of the Arctic Ocean. The Arkhangelsk Region will present the Library of the Russian North collection, which includes the greatest pre-revolutionary publications on the history of the region, including significant examples of domestic cartography, books by Russian and foreign travellers, unique statistical and bibliographic materials, and works by famous scientists on natural science, geography and much more. 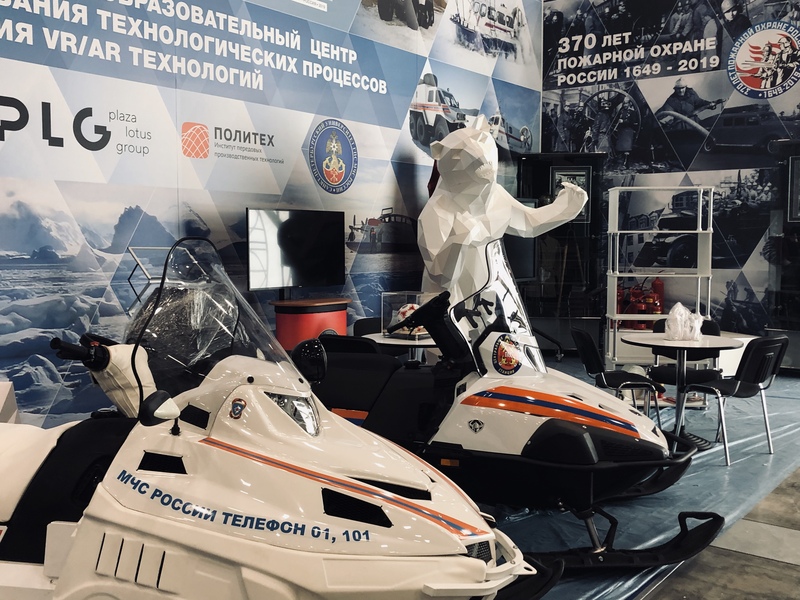 The Bauman Moscow State Technical University will feature experimental samples of ecosystem-preserving vehicles, remote-controlled robotic complexes, monitoring systems, and Arctic airfield support systems at the stand.